Plus, it was another good night in Europe for Italian football. A dejected Alexis Sanchez of Manchester United after the second goal for Sevilla. INCREASINGLY, Jose Mourinho’s stint in charge of Man United is beginning to resemble his time at Real Madrid. It would be harsh to consider Mourinho’s tenure at the club so far as a complete failure. After all, last season, the Red Devils won both the Europa League and League Cup, which seemed at least a step in the right direction after the largely disappointing years when both David Moyes and Louis van Gaal were at the helm. Since then, though, Mourinho and United have spent heavily. Having made Paul Pogba their record signing in the summer of 2016, they have since paid similarly exorbitant money for Alexis Sanchez and Romelu Lukaku among others. In the Premier League, only City’s level of spending is comparable with United, yet the Red Devils look miles behind their rivals in every sense. While Jose Mourinho’s side have beaten both Liverpool and Spurs this season, there is a far greater sense of optimism at the latter clubs, as not only do they have inferior resources to United, they also play much more attractive football. 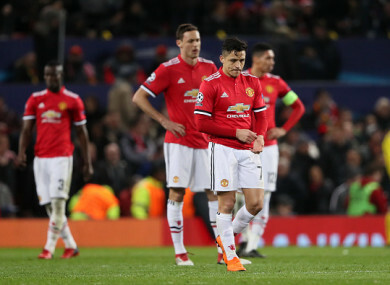 The one thing working in the Old Trafford outfit’s favour, however, was their ability to get big results in one-off matches, with last weekend’s 2-1 defeat of Liverpool being a prime example. However, Tuesday night’s loss means it seems destined to be a disappointing season at United. The best Mourinho can hope for now in this campaign is to emulate his predecessor Louis van Gaal and guide the club to an end-of-season FA Cup triumph, which begs the question as to whether they are any better off, after all the millions spent, since the Dutchman’s departure. Even the most ardent United fans will find it hard to deny that Sevilla looked the better team last night and deserved to go through over the two legs. Only David De Gea’s goalkeeping brilliance denied the Spaniards a victory in the first leg, while the visitors played the better football at Old Trafford to boot. They are far from the best side in Europe and are unlikely to go all the way in the Champions League, but Vincenzo Montella’s team were far sharper in their passing compared with the hesitancy and lack of creativity that dogged their opponents’ play. In addition, striker Wissam Ben Yedder now has eight Champions League goals this season — only Real Madrid’s Cristiano Ronaldo (12) has managed more. Once he was introduced off the bench, Sevilla finally had a player in the side to make their superiority count, having been largely ineffectual in the final third prior to this decisive change on 72 minutes. Conversely, the fact that United had just four shots on target over two legs against a side who are fifth in La Liga and conceded 12 goals in the group stages is a damning indictment of the Mourinho project. Moreover, nearby at City, the football is as brilliant as United’s is brutal, while players such as Raheem Sterling, Kevin De Bruyne, Fernandinho and Nicolás Otamendi have become markedly better under the guidance of Pep Guardiola. In contrast, the likes of Paul Pogba, Marcus Rashford, Anthony Martial and arguably even Alexis Sanchez have gone backwards with Mourinho managing them. The United boss previously helped the likes of Porto and Inter overachieve, while he also did extremely well at Chelsea during both stints there initially. But the Portuguese coach, one league title aside, invariably struggled at Real Madrid. The Spanish team’s players ended up effectively revolting against their manager owing partially to his deeply negative style of football. If United’s results and performances don’t improve imminently, Mourinho could again be left looking out of his depth at one of the world’s biggest clubs. After an ageing Juventus side defeated a more talented Tottenham team last week, due to a mixture of outstanding defending and wily tactics, Tuesday was another good night for Italian football. Roma beat Shakhtar Donetsk 1-0 to advance on away goals, having lost the first leg in Ukraine 2-1. And as with Juve last week, it was a classic Italian defensive performance. While the away side had 63% possession in the match, they could not even muster a single shot on target over the course of the 90 minutes at the Stadio Olimpico. Roma’s team is notable for having players that are solid but who could hardly be considered great — Edin Dzeko and Federico Fazio, who both started tonight, previously had fairly underwhelming stints in the Premier League. Daniele De Rossi, a key player in midfield, has had a highly decorated career and was world-class at his peak yet, at 34, has seen better days. The club have not been setting Serie A alight either — they are third currently, but a full 15 points behind leaders Juve as the season approaches its climax. So the fact that Eusebio Di Francesco’s men have made it to the last eight of the Champions League with a resolute but unspectacular group of players is clearly an indication of good management coupled with a strong team ethic. And while Italian clubs continue to punch above their weight, there is a sense that the Premier League has been underachieving and United’s dismal exit at the last-16 stage reinforces that view. England’s top-flight has 14 of the 30 highest-earning clubs in the world according to a recent survey, and while these fortunes could improve this year, they haven’t had a team in the Champions League final since 2012, with Chelsea and Man United being the only Premier League sides to win the competition over the past decade. There was a surprise in Man United’s team selection on Tuesday night. Marouane Fellaini only returned from a five-week injury layoff for the final 20 minutes against Liverpool at the weekend, but was preferred to both Scott McTominay and Paul Pogba for the must-win Champions League clash against Sevilla. It was a gamble and Fellaini struggled to make an impact, with the opposition largely dominant in midfield. The decision to withdraw Fellaini and belatedly introduce £89 million man Pogba in the second half appeared to be an acknowledgement by Mourinho that his pre-match call failed to pay dividends. In general, the Red Devils struggled to get a foothold in the game, with Juan Mata — who was excellent against Liverpool at the weekend — conspicuous by his absence until his introduction from the bench late on. All these decisions contributed to a subdued display from United, who only really came alive in the tie when Mata and Anthony Martial entered the action after 77 minutes, with the side having virtually slept walked their way through the previous 167 minutes of this vital two-legged last-16 clash. They finally grabbed the initiative and started to look threatening in attack, but by then, the tie was all but over and it was too little too late for a dramatic turnaround. Email “Questions to be asked of Mourinho project after Man United's Champions League no-show”. Feedback on “Questions to be asked of Mourinho project after Man United's Champions League no-show”.